“King decided to outline his ‘unthinkable’ suggestions candidly for the U.N. press corps waiting outside. He mentioned a bombing pause, talks with the Vietcong, and U.N. recognition of China. ‘In short,’ he told them, ‘my plea was that we have a negotiated settlement of this very difficult and agonizing and terrible conflict. When I left the United States to return home in June of 1968, it was just a couple months after Dr. Martin Luther King, Jr. had been assassinated in Memphis, Tennessee. Black violence had immediately exploded in all of America’s major cities following King’s death, and many smaller ones, and it seemed that the United States was dangerously fractured. The murder of Dr. King, who had been preaching Christian non-violence as the philosophy for the black civil rights struggle, suggested to many black Americans that the “black power” message Stokely Carmichael had begun to preach in Mississippi in the spring of 1966, had to be the way forward instead of Dr. King’s Gandhian methods. This is early Wednesday morning, November 26, 2014, and I am watching CNN reports of a second night of black violence in Ferguson, Missouri, and of nationwide protests in major American cities following a grand jury decision not to indict a white Ferguson policeman who had shot an unarmed black teenager dead. These sorts of protests, with street violence, take place in America from time to time, perhaps most notably following the video evidence of some Los Angeles policemen trying to beat one Rodney King to death. But, compared to what appeared to be Armageddon on the American horizon in April of 1968, the United States must have done a superior job of addressing whatever were the core causes of black alienation and violence 46 years ago. Dr. King’s life had always been in danger, from the time he became prominent in the civil rights struggle in 1955, because the United States is not only a white supremacist society, the United States is a violent society. But most observers feel that it was Dr. King’s public condemnations of the Vietnam War which caused his death. It was not long after Dr. King’s murder that Lyndon Baines Johnson, the Democratic President of the United States, announced that he would not be seeking re-election, as it was his right to do. Johnson, Vice-President under President John F. Kennedy, had been sworn in as President following Kennedy’s assassination in Dallas, Texas, on November 22, 1963. He had defeated Barry Goldwater of the Republican Party to win the 1964 Presidential election, and the American constitution allowed him to run for President again in November of 1968. But LBJ, as he was known, chose to back down. The United States was in a period of grave internal crisis. Under Johnson, the United States had escalated its involvement in a war between North Vietnam and South Vietnam, having taken the side of South Vietnam on the grounds that the North Vietnamese leader, Ho Chi Minh, was a communist. American foreign policy experts argued that if South Vietnam fell to the communists, the rest of Southeast Asia would quickly follow suit, and the result would be a communist expansion which would endanger the security of the United States. 58,000 Americans ended up being killed before the Vietnam War ended in 1975, with North Vietnam essentially victorious but very badly mauled by American firepower. The war outraged ever growing numbers of people on planet earth in the 1960s, because the United States was the greatest military power in the world, and North Vietnam was a poor, Third World country which had heroically defeated French colonialism in 1954, but was now being victimized by the United States, a nation whose rhetoric condemned colonialism. During the Vietnam War, America still had a military draft, which meant that all able-bodied American males, once they became 18, became eligible to be drafted into the U.S. military, trained and then flown to Vietnam to fight. The American casualty rate for the infantry was very high in the Vietnam War, while the casualties from post-traumatic stress disorder (what was known to us in Belize as “shell shock”) were taking place at an unprecedented rate. In other words, if you went to Vietnam as a foot soldier, the chances are you would either be killed, mutilated, or mentally crippled. Young white Americans were acutely aware of the casualty rate in Vietnam, and they were finding ways to avoid the draft or refusing outright to be drafted in growing numbers. Young black Americans were mostly accepting the draft, but when respectable leaders like Dr. King began to point out how many billions America was spending daily to fight the Vietnam War at the same time when black Americans were experiencing unacceptable levels of poverty, this was a turn of events which the America power structure could not tolerate. Hence, Dr. King, the highest-profile black leader in America, ended up paying the ultimate price for his honesty. The United States abolished the military draft soon after the Vietnam War was concluded. Their military, still the most powerful in the world by far, is described as a “professional” military. What this means, and how they acquire the personnel for that military, is not exactly clear to me. But, the American economy being the largest in the world, they have the unlimited resources necessary to obtain the manpower for their military without forcing all their able-bodied young men to register for the draft. By eliminating the draft, America calmed the fears of their young whites, who then went on to pursue mainstream careers in the American economy. The United States must have also made moves to address the issues in their black communities, because there has never been anything since 1968 like the black uprising following Dr. King’s assassination. When they have a major problem in America, what they do is have their most brilliant experts come together and strategize. In fact, there are permanent institutions popularly referred to as “think tanks” whose job is just that – figure out troublesome problems and propose intelligent solutions. The thing is, these American experts are taken very seriously by their political and other leaders. American politicians rely on their scholars and experts for intelligent advice. 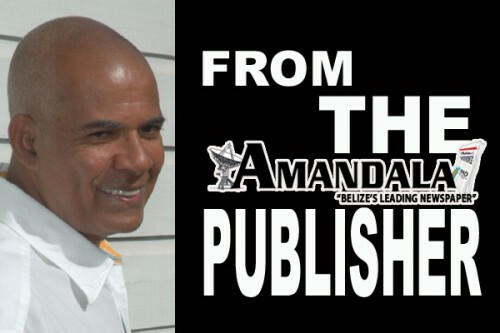 In Belize, our society has become too politicized. I guess it always was. Ernesto Torres may be our only qualified traffic expert in Belize. Even though he once ran on a UDP City Council ticket, back in 2003 or thereabouts, the UDP politicians in City Hall and Belmopan never ask him for advice. Torres is no longer politically acceptable. He offers advice in an unsolicited manner on weekday morning talk shows. His expert traffic knowledge is being wasted. The question always is: which came first, the chicken or the egg? Was Torres declared unacceptable in his professional capacity before or after he made himself politically undesirable? The above is what I mean by saying that our society is too politicized. Along with the PUP in running last, appears to be good sense. Party politics rules. They don’t operate that way in America. In that regard, the United States must be given their respect.